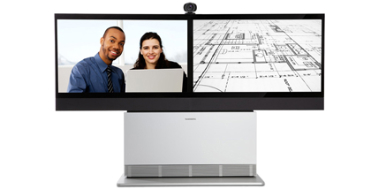 Dual screen options on the 42, 46, 52 inch and 65 inch High Definition Profiles are designed for highly collaborative meetings, allowing participants to see the full group and multiple presentation sources. 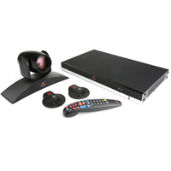 LifeSize Room 220, you get the highest level of quality available today -- Full High Definition, standards-based 1080p30 for the highest resolution on the market and 720p60 for the best motion handling with lower latency. But, LifeSize Room 220 comes standard with an embedded 8-way Continuous Presence multipoint bridge showing 4 visible sites, complete with transcoding and all digital I/O. Plus, LifeSize Room 220 also has a point-to-point throughput of 8Mbps. And the compact, sleek unit is less than half the size of comparable solutions. 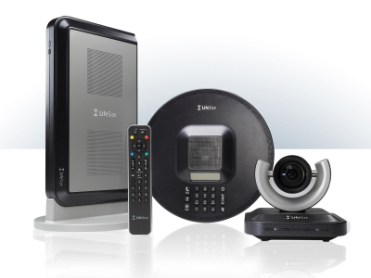 Quality video conferencing that is simple to use while increasing productivity and providing a quick return on investment. The Polycom QDX 6000 video conferencing system delivers high quality DVD resolution video and CD quality audio along with simple-to-use content sharing capabilities. With the TANDBERG Content Server organizations can access live and on-demand presentations, distance education classes and corporate training sessions anywhere, anytime. Capture and distribute live or recorded content to any computer in Microsoft Windows Media, QuickTime compatible Mpeg4 and RealPlayer® formats. Download content to your favorite portable media device or share it through ItunesU.